C Hollands Haulage Ltd has been in business for 36 years and have always worked for Tarmac. C Hollands Haulage Ltd are currently have five 32000 kg Tipper Lorries and one 44,000 kg articulated lorry. The company operating base is in Radlett and has eight full time employees working in the main on a 24 hours basis. 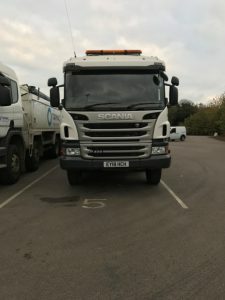 C Hollands Haulage Ltd work for Tarmac in taking away plainings on behalf of Tarmac as well as hauling aggregates on behalf of Tarmac too during the. 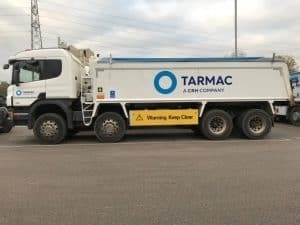 The company have both a day time and a 24-hour operation in place and operate exclusive for Tarmac which include working on contracts for TfL and CVU. When introduced to FORS by Tarmac it soon became apparent that the standards of FORS were the same standards required by Tarmac and as such, would be standards which C Hollands Haulage would be proud to adopt. FORS alongside Tarmac promote road safety and improved driver training, therefore making the roads a safer place to be, while protecting the environment by using vehicles with a less polluting emissions. At C Hollands Haulage Ltd we take road safety seriously and FORS allows us to give the driver a better understanding of road safety, through training and toolbox talk awareness. FORS has helped benefit by us being able to achieve better standards through their driver training programme. Three of our vehicles are at Euro 6 standard and have adblue engines, so as to reduce pollution to the environment. While two vehicles are on the replacement program throughout 2018/19 to be replaced with Euro 6 engines and N3 lowered cabs. These vehicles will also be equipped to the highest safety standards. All vehicles are already fitted above the FORS requirements with Collision Manager and lane departure warning manager, along with overhead power cable sensors. All vehicle are climate controlled and are designed for the driver to do a days work in comfort. This allows for a less stressed driver and for a better driver ride experience, thus reducing the drivers awareness of the road and their surroundings. .
All our drivers have completed Safe Urban Driver courses within the 5 year period and all drivers are required to complete all the FORS E-Learning Modules. We have a recruitment policy that outlines that we need to look at employing younger drivers/employees and provide training to that particular role. C Hollands Haulage Ltd accident rate has remained at zero over the past five years. This has saved both time and money in reduced claims to the company. Using our Bronze accreditation as a baseline, we decided that Silver Accreditation in 2017 allowed us to gain a better understanding of road safety and driver awareness, while allowing us to monitor driver performance and fuel performance. This year we have been able to improve on our percentage of fuel used by 1% and feel sure that as more Euro 6 vehicles come on line, this figure will only improve. All our drivers are required to fill in an in-depth medical declaration on an annual basis even though through the FORS Standards it is recommended every 5 years. A record of disclosed medical issues is kept by the company and monitored to ensure drivers are at all times fit for the road. The driver’s handbook requires the drivers to report any change to the company and this forms part of their contract of employment. C Hollands Haulage Ltd have a recruitment policy that outlines as a company that we are committed to employing young drivers/employees where possible and training them into that role. Maintaining our Gold Standard will help the company to work towards these goals and help to improve the industry’s safety standards, whilst looking towards reducing our emissions through less polluting vehicles.